Premiership leaders Saracens lost for the first time this season, ending with 14 men as Harlequins won at The Stoop. Jack Clifford's try gave Quins a 15-14 lead at the break after Neil de Kock and Billy Vunipola crossed for Sarries either side of Rob Buchanan's score. Owen Farrell kicked three penalties after the break but Ben Botica's boot got Quins back ahead after Sarries prop Rhys Gill was sent off. 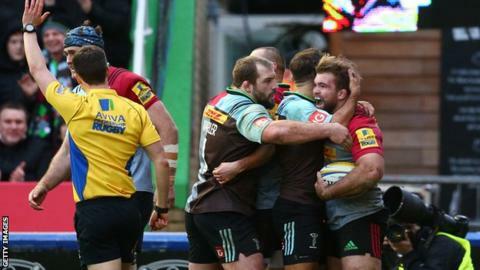 Lock James Horwill scored late on to confirm victory for Quins. The Australia international's late intervention not only sealed Harlequins' first win over their north London rivals since March 2012, but brought to an end to Saracens' 15-match winning streak, which stretched back to last season. Sarries got the game's first try through De Kock after Horwill had been sent to the sin-bin for striking England second row George Kruis, who had to be stretchered off the field with concussion following lengthy treatment. Director of rugby Mark McCall confirmed Kruis was knocked out in the incident, adding: "George is fine. There is nothing wrong other than the concussion...he'll do the normal checks." Smart work from Danny Care allowed Buchanan to reply for Quins but trademark scrummaging from Saracens set up Vunipola for their second try. After Clifford's late score gave the home side a slender advantage at the break, Farrell and Botica traded penalties in the early stages of the second half. The turning point came on 65 minutes with Sarries leading 23-18, as Gill was initially shown yellow for a tip-tackle on George Lowe - only for referee Craig Maxwell-Keys to decide to show the prop red instead after consulting the television match official. Botica put Quins back ahead with two more penalties before Horwill secured victory at the death. "A huge turning point was Rhys' sending off, but I don't think you could argue with that. "I'm really thankful that there was nothing wrong with George Kruis but when you look at the actual play, James is coming in and he is going to clear a ruck. "Kruis is going down and there is nothing malicious in it but we have to protect players so we will take the yellow. "It was a great game of rugby between two teams who will hopefully be fighting it out towards the end of the year." "I think it was a red card. There are no complaints. Rhys has just come on to the pitch, he's trying to make a good tackle and someone else is involved. "It made it look worse than it is, but you always run the risk in those situations. "In general we didn't deserve to win. Our discipline wasn't good enough. They won the scraps and were really up for it. "All those 50-50 battles that we're pretty good at, we weren't so good at. It's disappointing to lose." Harlequins: Brown; Yarde, Lowe, Roberts, Chisholm; Evans, Care (capt); Marler, Buchanan, Jones, Horwill, Matthews, Robshaw, Wallace, Clifford. Replacements: Ward, Adeniran-Olule, Gray, Merrick, Sloan, Dickson, Botica, Walker. Saracens: Goode; Ashton, Bosch, Taylor, Ellery; Farrell, de Kock; M Vunipola, George (capt), du Plessis, Hamilton, Kruis, Wray, Fraser, B Vunipola. Replacements: Saunders, Gill, Lamositele, Itoje, Burger, Wigglesworth, Hodgson, Tompkins.